Not to forget the deep connection between drama and trauma — and the “teatron” as a place for looking/looking — looking into the wound, into the trauma; and listening to the theory of it all. The interplay between the catharsis of the player and the catharsis of the watcher/listener, aye, there’s the rub. I’ve never heard of the “teatron”. Tell me more. Is it from one of your radio works? Yes, what/where is the place of listening to the theory of it all in the experience? And what’s that about the rub? Typing too fast — the word is theatron, or “looking place”. Related also to theory — in ways much discussed by lit theorists. And the rub: well I am always fascinated by the tension and possible (inevitable?) divergence between whatever catharsis may be experienced by actors in performance (it does happen) and the educed catharsis of the watcher/listener. Sometimes the player uncovers one wound, while the audience may uncover a gash elsewhere. Possibly irrelevant to a discussion of BB, which I have not seen — but shall dip in to season 1 on your prompting. I didn’t realize the Greek theatre was called a ‘theatron’. Thanks for that. Concerning catharsis, I gather it is also discussed sometimes as a process that occurs in the play. Rather than in the players or the audience. This last summer, I watched all of The Sopranos. Had only seen a few episodes previously. I watched it cuz I read various people describe it as the best TV series ever. And a fine work it is. But I found Breaking Bad riveting in ways that I didn’t experience with The Sopranos. 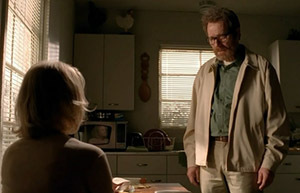 Although probably Breaking Bad was seriously influenced by The Sopranos: the sense of humour and the dark anti-hero among probly other things. TV drama seems to have matured rather fruitfully. It’s said that the smaller audiences of the ‘narrowcast’ have been important to that maturation. TV’s become less a mass medium. Shows like The Sopranos and Breaking Bad are meant for adult audiences. The writers haven’t had to worry about writing for 14 year-olds. It seems that the audience for serious cinematic drama has more or less migrated to television. And these two series are as lengthy–perhaps moreso–than many a novel. It used to be that only the novel had the sort of length to carry the sort of psychological depth of portraiture we associate with many 20th century novels. Breaking Bad is 62 episodes long; 62 hours. That’s about how long it takes to read some novels; longer than some. And one of the key things about Breaking Bad is that the premise pretty much limits the duration of the series. It isn’t constantly hitting the ‘reset’ button. There’s a strong narrative arc from beginning to end. Like a novel.